What I want [not yet what I produce] is music to question, to ascultate, to approach the problem of being. On Stroke By Stroke, Dimitra Lazaridou Chatzigoga’s remarkable solo work released this very hot and humid July, 2011, on Organized Music From Thessaloniki, the windows in Chatzigoga’s house are thrown open; you can hear the streets of Athens enlaced in her apothegmatic pieces for a radically prepared and refashioned zither. Knowing this, anyone even somewhat alert to the events in the streets of Athens from May of 2010 to the present, almost precisely the period of time bracketing the home recordings heard on Stroke By Stroke, will inevitably bend their ear for aural evidence of the crisis and conflagrations staged in the public spaces of Athens. I do not hear the explicit sounds of police brutality or the massive organization of strikes and demonstrations conveyed with heavy-handedness, say, by dint of T.V. or radio captures [cf. Tony Conrad’s Bryant Park Moratorium Rally , a recording of similar street energies infiltrating via a composer’s windows], or troweled on with field recordings . I do hear alarm [and alarms], pieces bearing up under tremendous tension and distress, the sounds of sheared metal, what sounds like bowed iron gates, and the unnerving shuttle of warp beams on a ghostly loom. Chatzigoga has articulated [or as the poet Michaux has it, more surgically, auscultated] the spirit of her adopted city with great subtlety, juxtaposing the mechanized and harsh strokes of some of the 21 tracks, with moments of calm, clarity and tenderness. The links to Michaux are not limited to the titular one; Chatzigoga obviously shares with the poet the status of artistic outlier. Born in Thessaloniki in 1981, her entrée into this sound world came about while she was obtaining a Ph.D in theoretical linguistics at the University of Barcelona in 2004. It wasn’t long before Chatzigoga found an affinity with the improvised musicians she met there. She formed the working duo Ap’strophe with Ferran Fages, collaborated with Tishe Mukarji, Felipe Araya Munoz, Birgit Ulher, and many others. Chatzigoga clearly has found an affinity between her music and language, outside of her doctoral specialty, the linguistic notion of indefiniteness [a cursory check of her work in this area – at this date, Google produces nearly as much about Chatzigoga’s doctoral thesis as her sound work – gave me a headache, along with that familiar sense of ego-puncturing that is concomitant to every reminder that there is an immense amount of investigative work going on in the world that I cannot possibly get my arms around]. The connective tissue between her music and language I can grasp is her love of poetry – Corgroc, her fantastic duo with Fages from 2010, is structured in two sections bearing the broken line of the e.e. cummings poem spring is like a perhaps hand. Chatzigoga’s regard for the poet Michaux, whose dark, ruminative and entirely unsentimental poetry yields to her a title that makes more and more sense with each listen to Stroke By Stroke, sent me to a considerable review of his collected works. It struck me that much of his later writings are, like these 21 darkly-imbued offerings, epigrammatic, and also braid together the brutal and the tender. Suffice it to limit myself to only a few lines, to illustrate; He who leaves a trace, leaves a wound. The bird’s ravings have no interest for the tree. He who sings in a group will put his brother in prison when asked. I will set those lines, as unsparing as anything from Beckett, against the anxiety and strife carried through Chatzigoga’s windows in the heart of Athens, and alongside the pneumatic-jackhammer-with-sine-tones heard in her piece any and all, or the insistent, floating siren of emergency. But there is also this; He who hides his madman dies voiceless. And I wanted to draw the consciousness of existing and the flow of time. As you might take your pulse. I will set those lines alongside Chatzigoga’s beautiful, terse tone poems woody woodpecker and common ground – the first owning a silly title that does not convey its floating gamelan rhythms, the latter a similar dance of sprung rhythms amid the dire sound worlds of pieces like parasite and torrent. Or even draw your attention to Stroke By Stroke’s opening stroke, gargaretta, 12 seconds comprising its entrance and exit, the windows thrown open to Athens’ streets, the moment at which I knew I was in the severe and tender hands of a remarkable musician. 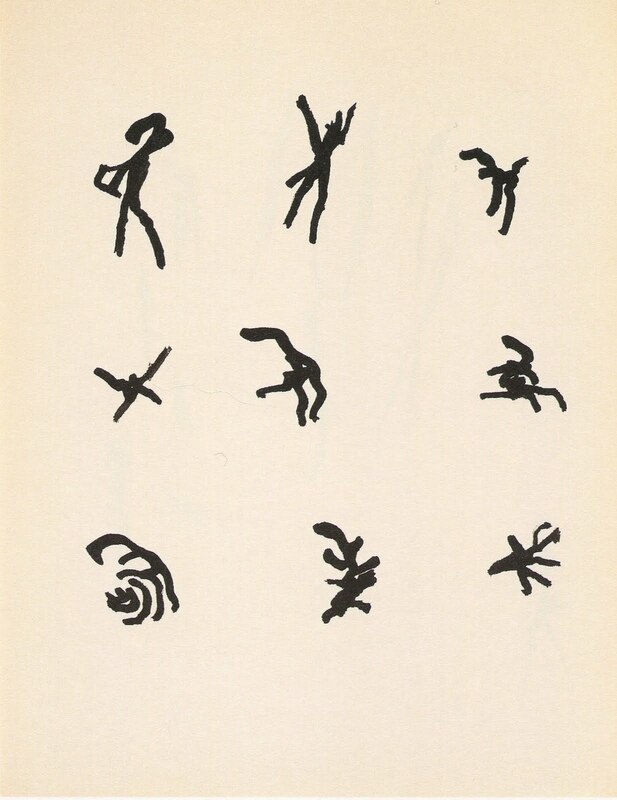 Lines from Michaux are found in Darkness Moves: An Henri Michaux Anthology 1927 – 1984, University of California Press, and Selected Writings: The Space Within, New Directions. This entry was posted in music writing on July 11, 2011 by jessewgoin.